Warrington Housing Association is delighted a new funding scheme has launched to help older residents in the borough cover the costs of small repairs and adaptations to their home. Residents, who own their own home, and are aged 60 and over or disabled, can apply for up to £350 through the Better Care Fund, to make practical changes to their home, such as heating and electrical repairs, boiler and fire servicing and improvements to reduce the risk of falls. Geraldine Kiddle, director of Warrington Home Improvement Agency (WHIA), who will be undertaking the work in partnership with Warrington Borough Council, said: “It is critical that we help people who are at risk of admission to hospital by addressing avoidable risks in the home. “With this fund we will be able to get repairs and improvements done quickly to make a real difference to a person’s health, keeping them warm through heating system repairs, or helping them get around the home safely. One person who has benefited from the fund is Warrington resident John Marsden. After a fall at home, John was referred by the NHS Falls Team to Warrington Housing Association’s WHiA service for repair works to be done to improve his home environment and prevent future trips. He is now at a significantly reduced risk of falling and his walking trolley is able to go smoothly all around his bungalow. Alongside the repairs and adaptations, applicants will also be able to access free advice to save money on bills and make sure eligible benefits are claimed. Councillor Pat Wright, executive board member for Statutory Health and Adult Social Care at Warrington Borough Council, a: “We’re delighted to be working with WHIA to make sure some of our most vulnerable residents have support available to them”. To find out more about accessing the grant, contact the WHIA team on whia@wha.org.uk or call 01925 246 812. 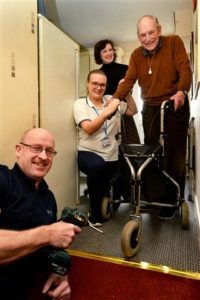 Warrington resident John Marden with WHIA handyman Paul Saxon, WHIA director Geraldine Kiddle and NHS Falls Team Nurse Harriet Simpson.